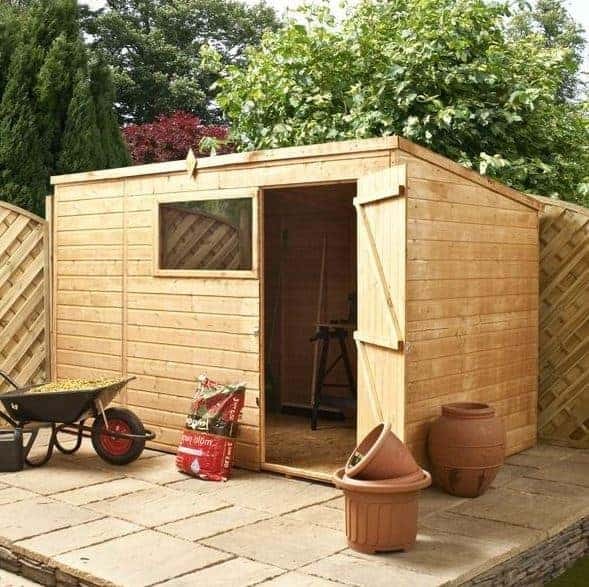 This is an extra-wide wooden pent storage shed, armed with many great features. Waltons have made sure this building is both weather resistant and secure. A 10 year anti-rot warranty highlights just how durable the shed really is. Whilst benefitting from a high quality design, it also comes at a low, affordable cost. A pent roof is used to ensure the shed will comfortably fit underneath trees, in front of buildings and next to fences. With its gentle slope, rain simply washes right off the roof, down to the floor below. A sand felt covering protects the roof’s materials from damp, lengthening its lifespan. It’s the small details that matter and this can be seen in the bracing of the door. Preventing it from sagging, the door will stay strong and stable for many years. It also has an added pad bolt. More effective than a simple butterfly catch, the pad bolt keeps the doors closed even in high winds. If you add a padlock, it will also ensure the shed is safe from potential thieves. The solid sheet floor could be a little stronger, but you do have the option to upgrade. 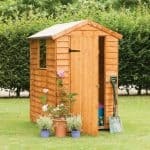 All in all we’d recommend this shed to those looking for something more unique with an abundance of storage space. Solid sheet materials provide adequate support for medium weight, but not heavyweight storage. This means an upgrade may be required. 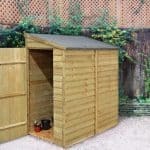 This is a top quality, pent wooden storage shed which can also be used as a workshop. Offering a great spacious design, it benefits from a wider build than other similar size buildings. We find its pent roof gives it a less traditional look and offers great space saving benefits, allowing it to be installed below trees. This shed has a completely different design to most other sheds of the same size. Its width is what really makes it stand out. This makes it suitable for gardens which may not have a lot of depth, but which do have a wide design. 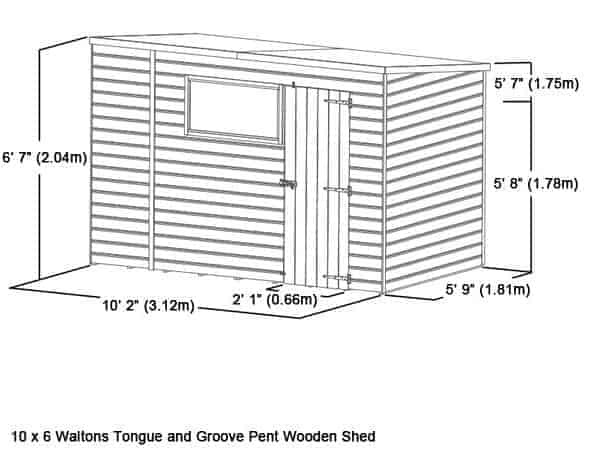 In height, the front is taller than the back which is standard for a pent shed. 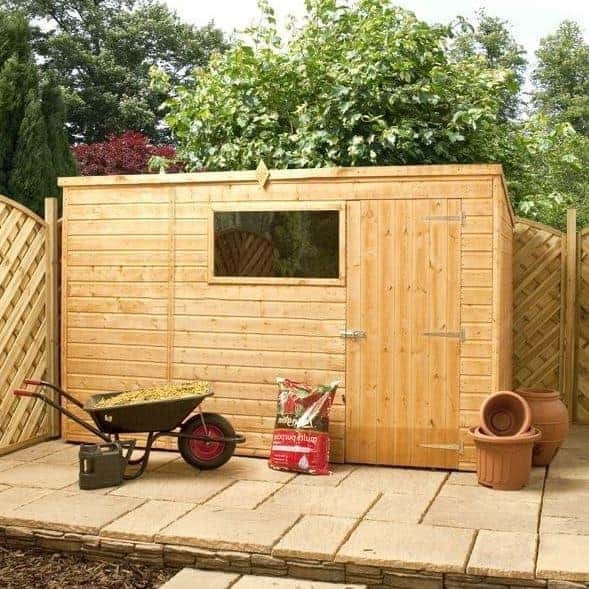 The door also comes with a standard width, offering simple and easy access into the shed. Overall the measurements are pretty common, with the width being the only thing that truly stands out. We’re always a little disappointed when a tongue and groove clad shed comes with solid sheet materials for the roof and floor. The actual thickness of these boards is the same as you’ll find in many wooden sheds, with the floor measuring 10mm and the roof’s materials measuring 8mm. Unfortunately they do feel flimsy and don’t give the highest quality appearance. 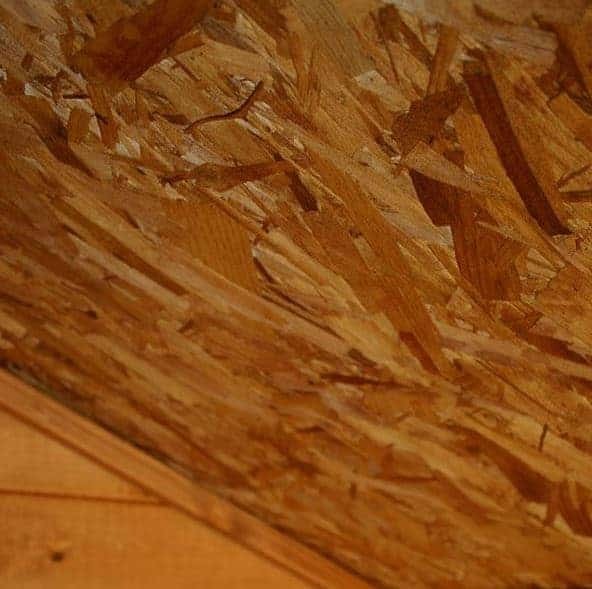 This isn’t so much a problem for the roof, but it is vital the shed’s floor has a strong, solid design. To strengthen the roof we’d advise adding a few joists. A support pack for the floor measuring a thickness of 28mm is included so that is a slight benefit. It definitely adds a lot of extra thickness, boosting its maximum weight capacity. You can also opt to spend a little more money further upgrading to the extra strength pack. Both support packs include joists which just slot in-between the current joists of the building. The roof and floor of the shed may be a disappointment, but the walls are surprisingly strong. This is because they are created with premium Shiplap tongue and groove. 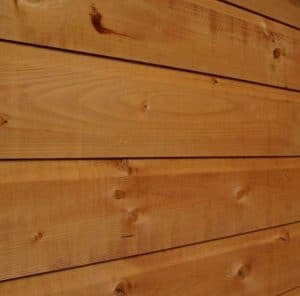 The thickness of Shiplap does vary, but this shed uses the standard 12mm panels. They offer a great water-tight seal and also offer good security as they are fairly tough to get through. 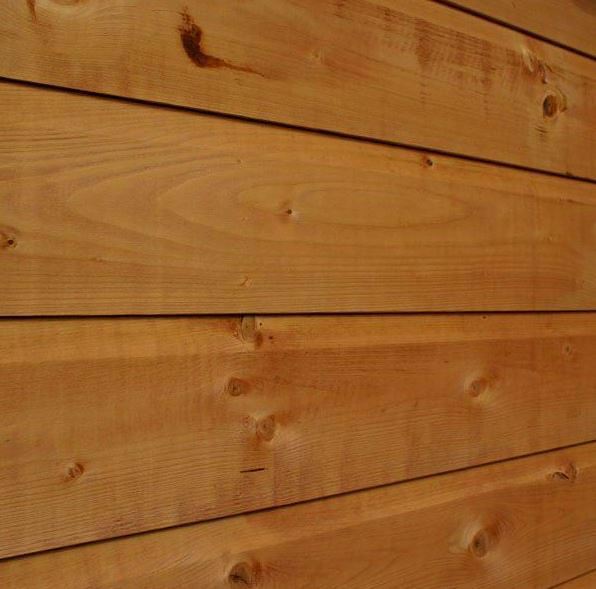 As it is constructed with Shiplap tongue and groove style cladding, the benefits you receive are pretty impressive. The tongue and groove benefits alone are fantastic. Firstly they are very easy to assemble. If you’ve ever fit a laminate floor, you’ll recognise the tongue and groove installation, with each panel simply slotting into the next. It forms an interlocking design which helps to keep drafts and rainwater out of the building. Another similarity to laminate floor installation is that tongue and groove clad buildings come with an expansion gap. This is there in case moisture or heat cause the timber to warp throughout the course of the year. If it does swell, the gap makes sure it doesn’t affect the structure of the building. Shiplap also offers incredible benefits in comparison to overlap. The overall finish of the panels is smooth and thick, but that isn’t where the benefits end. More importantly, every panel comes with a built-in groove. Located in the centre of the panels, this indented feature acts as a strong defence against rainwater. 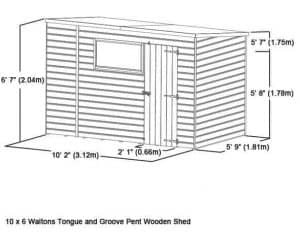 So taking into account the benefits of both tongue and groove and Shiplap, you have a shed that is guaranteed to offer long lasting protection against the elements. The interior isn’t quite as strong as the exterior, as highlighted by the solid sheet materials. However, we are pleased to see that a thick, standard 28mm x 28mm framing is used. This does help to keep the shed standing strong and it offers more than enough support for the high quality cladding. 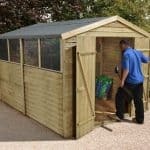 Whilst the shed does require treatment after assembly, you’ll be pleased to know you don’t necessarily need to treat it every year. If you use a spirit treatment, which we recommend, you’ll be able to extend the treatments to every 2 years potentially. However, you will need to check the manufacturer’s instructions to see when the particular treatment you do buy should be reapplied. Spirit treatments offer a deeper and much more effective weatherproof barrier than water treatments. They work inside the timber, as well as on the surface. So as the surface barrier is worn down, the shed is still protected from the inside which is why you don’t always need to apply them annually. Due to this extra, longer-lasting protection however, they do cost a little more than the water treatments. They also don’t provide you with the same amount of colour options as water treatments. If you would like a coloured finish, we suggest using a water treatment over the top of the spirit treatment. Waltons give you a free Golden Brown resin enriched water treatment so you can add this for colour if you want to. Of course, you can skip the spirit treatment and opt straight for a water treatment, but we would advise applying these once a year; especially if you want to be protected by the shed’s 10 year anti-rot guarantee. A single, braced ledge door provides spacious access into the shed. It is located on the edge of the building, rather than the middle and like the rest of the building, it has a tall design, making it easier to transport tall tools. There is a pad bolt installed on the door so you can ensure it is securely closed when not in use. A large rectangular styrene glazed window features on this building. It has a wooden framed design which makes it stand out, acting as an attractive focal point. Glazed with 2.5mm styrene, it is shatterproof and a lot stronger than a single glazed window. Compared to similar overlap sheds, the Shiplap tongue and groove cladding provides good security. It is hard to break through and offers a very solid design. However, that’s where the security features stop on this shed. 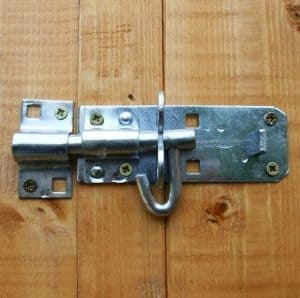 The pad bolt does not lock the door, it simply keeps it closed. So you will need to buy a separate padlock to ensure it is safe from thieves. We’d actually also recommend getting rid of the pad bolt altogether as it doesn’t have the most secure design. It’s fairly flimsy and could easily be removed with a screwdriver. So a hasp lock would be much better suited if security is important to you. It also isn’t a private building, though there are ways to improve this. Netting, curtains or a blind could be installed which would dramatically improve the privacy provided. You can customise this shed in three different ways. The one we’d highly recommend is upgrading the floor. Now although the shed is provided with a 10mm solid sheet board floor, it does come with a 28mm support pack from Waltons absolutely free. So you may find this sufficient enough to comfortably handle the weight of your storage. However, as the extra strength support pack isn’t too expensive, we’d recommend investing in it anyway. It won’t just give you peace of mind, it will also help to guarantee the longevity of the floor. Another option we’d recommend is the Superior Duty felt. Providing a more sophisticated, textured design, this fibreglass roofing felt is self-adhesive and will not perish over time. Many customers have found the heavy duty sand felt included with the building a little too flimsy. There’s no denying it is thin and doesn’t give the impression it will withstand harsh weather for years to come. 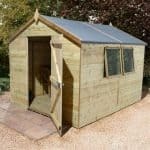 So upgrading to the stronger, higher quality felt would again add to the shed’s longevity and provide you with that all important peace of mind. One of the more noticeable ways to customise the shed is through coloured treatments. Now treatments are required anyway, but this one does come with a free Golden Brown 5L tub treatment. If you’re content with the colour it can save you having to fork out extra money for the first year’s treatment. If you want another colour however, there’s quite a wide choice available from Autumn Gold to Cedar Red. Four extras are available with this building, though in our view not all of them are required. Let’s talk about the ones that we do think you’ll find the most useful. First up there’s the 10×6 Waltons Portabase. This is one extra we really can’t recommend high enough. 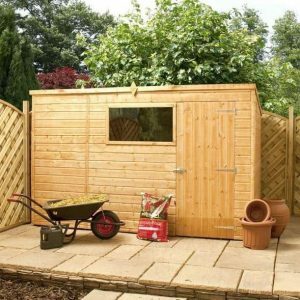 Before you erect the shed, it’s incredibly important to make sure you are installing it on top of a very flat and solid surface. Fitting a concrete base can be costly, whereas this solid Portabase is both cheaper and it makes it easier to assemble the building. As well as the obvious benefits, the base also lifts the shed floor off the ground. This helps to ventilate it, stopping any damp from getting to the floor, protecting it from rot. It is a more expensive extra, but definitely worth the cost. Next up there’s the weatherproof padlock. With a hasp and staple, this 49mm lock has some really great benefits. For example, it comes with double locking and is protected by a Thermoplastic weatherproof jacket, as well as a steel laminated body. It can be instantly installed onto the pad bolt fitted on the shed’s door. Offering a high level of security, it’s definitely worth the £9.99 price tag. Wooden shelving sets provide a perfect solution to those who need to increase the amount of storage space provided. As mentioned, overlap cladding is not suitable for interior shelving. However, these are shelf sets with a difference. They don’t actually attach to the interior walls. Instead they stand on the floor and consist of two or three tiers. As they are manufactured with 16mm tongue and groove, we would recommend upgrading the floor to ensure it holds the weight. The shelves themselves can hold very heavy tools and even toolboxes. They come in 3ft-5ft lengths and could be a very useful addition to the building. The last extras on offer which we personally feel are the least important are the Draper accessories. Walton’s offer these with many of their outdoor buildings and they are basically DIY tools manufactured by Draper. The accessories on offer here are a DIY 2 piece spirit level set and a 14.4v cordless rotary drill. The only thing that lets this shed down in terms of quality is the solid sheet materials. Helping to keep the cost down, these aren’t as sturdy as tongue and groove materials and will likely need to be upgraded. The tongue and groove cladding adds fantastic longevity to the shed thanks to its natural weather resistant features. However, it still requires treatments to maintain this water resistance and the solid sheet materials will need to be upgraded if you want to maximise its durability. Whilst the floor could do with upgrading to accommodate heavier weight storage, the actual amount of space on offer is great. The walls are also strong enough to support hooks and shelving so this gives you more storage opportunities. 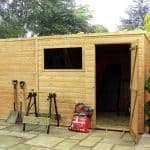 If you choose to assemble the shed yourself, it is going to take up anything from half a day to a full day to install. This is largely down to the weight of the panels. It is a fairly big building so you should only attempt to assemble it with 2 people. 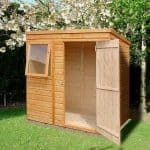 This does come at a slightly higher cost than some similar size sheds, but that’s because it has a stronger overall design. Taking into account its main features and the fact you can potentially save on the regularity of the treatments required, we feel this building offers superb value for money. Final Thoughts: This wide shed offers an outstanding amount of storage space. Though its floor could use an upgrade, you still receive great value for money. Its walls are thick and strong enough to withstand the weight of interior shelving, helping to further add to its storage potential. The pent roof may be less common than the apex design, but it provides just as much water resistance, helping to protect the building from rot. We really like this shed and are particularly impressed with its extra-wide design. The free floor support kit and treatment is also a nice bonus, making this a super shed to consider.